Municipal Lake in Yaoundé's Lake Quarter with the Ministry of Posts and Telecommunications - MINPOSTEL (right). The capital city of Cameroon has a population of approximately 3 million people (in 2019), it is the country's second largest city after the port city of Douala. A virtual guide to Cameroon, the country in Central Africa is bordered by the Gulf of Guinea (Atlantic Ocean) in south west. Cameroon borders Nigeria in north west, the Republic of the Congo (Brazzaville), Gabon and Equatorial Guinea in south, the Central African Republic and Chad in east, and it has a narrow lakefront at Lake Chad in north. With an area of 475,650 km², the country is almost as large as Spain or slightly larger than the US state of California. Its southern and coastal areas are characterized by dense vegetation, a vast river system and a hot, humid climate with abundant rainfall. Largest city is Douala, the country's main port and economic capital with its commercial and industrial activities, Yaounde is the second largest city and the political capital of Cameroon. Other major urban centers are Edea, characterized by its heavy industry and its hydro-power plant, Limbe, headquarters of the oil industry and Kribi terminal of the Chad-Cameroon pipeline. Cameroon has a population of 24 million people (in 2016), English and French are official languages, however French is by far the most commonly used language. The name Cameroon is derived from the Portuguese word, Camaroes, meaning shrimps. As Portuguese sailor Ferdanando Poo arrived in 1472 at the Wouri river in Douala and discovered so many shrimps in the river he decided to call it Rio Dos Camaroes (River of shrimps, in Portuguese). It was from this word that the territory derived its name which is now spelt in various forms: Spanish spelt it Cameroes; Germans, Kamerun; English, Cameroon; and French, Cameroun. The territory was colonized by the Germans in 1884 but after the end of the First World War Cameroon was mandated by the League of Nations to the French and British governments. France took the greater sector, formally known as East Cameroon, while Britain took responsibility over former West Cameroon known then as "Cameroon under British Administration". On January 1st 1960 the French Sector became independent under the new name of Cameroon Republic. Following agitation for independence by the Southern Cameroons - before the name was changed to West Cameroon - a plebiscite was held in that sector of Cameroon on February 11th 1961 under the United Nations supervision. The result of the plebiscite was overwhelming for reunification (233,571 against 97,741) and gave Southern Cameroon automatic independence and unification, which was achieved on 1 October 1961. Thus after the reunification of both sectors, the Federal Republic of Cameroon was born. After a referendum in May 1972, Cameroon became a United Republic and by a Presidential Decree of 1984 it became the Republic of Cameroon. Other Cities: Douala, major seaport and commercial capital (1.3 million), Garoua (424,312), Maroua (409,546), Bafoussam (319,457), Bamenda (321,490), Nkongsamba (166,262), and Ngaoundere (216,300). Republic; with a strong central government dominated by president. 1 October 1961 (for territory formerly ruled by Britain). Constitution: 2 June 1972, last amended in January 1996. Area: 475,650 km² (183,650) sq. mi.). 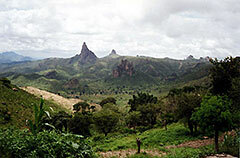 Terrain: Northern plains, central and western highlands, southern and coastal tropical forests. Highest peak: Mt. Cameroon (13,353 ft.). Central and western highlands where Yaounde is located--cooler, shorter dry season; southern tropical forest--warm, 4-month dry season; Coastal tropical forest, where Douala is located--warm, humid year-round. Nationality: Cameroonian(s); French noun and adjective--Camerounais(e). Religions: Christian 53%, Muslim 22%, indigenous African 25%. Natural resources: Oil, timber, hydroelectric power, natural gas, cobalt, nickel. Agriculture products: timber, coffee, tea, bananas, cocoa, rubber, palm oil, pineapples, cotton. Exports - commodities: crude oil and petroleum products, lumber, cocoa beans, aluminum, coffee, and cotton. Imports - commodities: machinery, electrical equipment, transport equipment, fuel, food, cereals, fish. The Presidency of the Republic of Cameroon at Unity Palace. Official website of the PM and government gateway site. Official Website Embassy of Cameroon in The Hague, Netherlands. National Institute of Statistics of Cameroon. Map showing Cameroon's administrative regions. 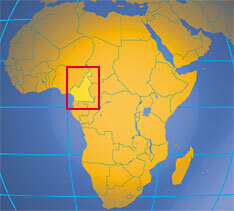 Searchable map and satellite view of Cameroon. Searchable map and satellite view of Cameroon's capital city. Elephants in Waza National Park in Far North Region of Cameroon. Now Up Station Mountain Club, a collective African, Cameroonian blog. 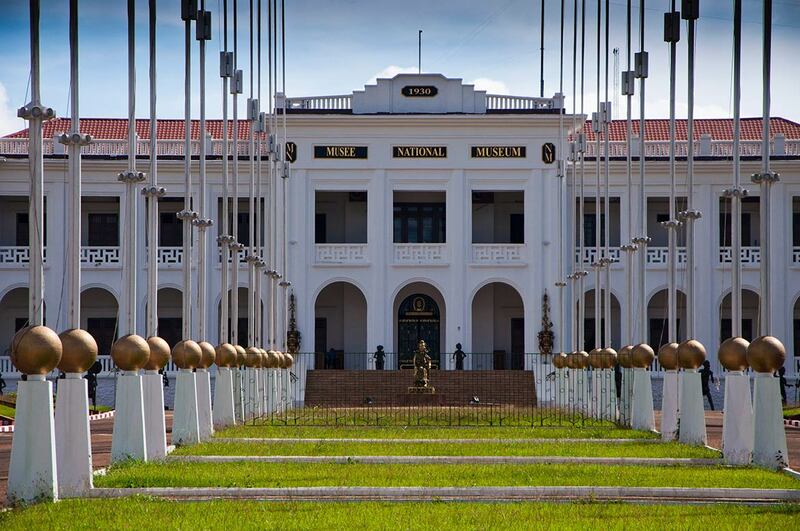 UNESCO page about Cameroon's National Museum with its traditional African art collections. Spotlight on the Bakweri Society and Culture. Culture, music and rites of initiation of the hunters and gatherers of the Central African rainforest. Official website of Cameroon's national soccer team. Because of its oil resources and favorable agricultural conditions, Cameroon has one of the best-endowed primary commodity economies in sub-Saharan Africa. Still, it faces many serious problems such as stagnant per capita income, a relatively inequitable distribution of income, a top-heavy civil service, endemic corruption, and a generally unfavorable climate for business enterprise. Site about exploitation of oilfields in southern Chad, by a consortium of oil companies (Esso, Petronas and ChevronTexaco), and the building of a 1,070 kilometer (663 miles) underground pipeline to a marine terminal off the coast of Cameroon. Summary about Cameroon's economy by The Heritage Foundation. Camair-Co is serving as the flag carrier of the country, it operates out of Douala International Airport. Cameroon Airlines was Cameroon's flag carrier, it operated flights in Southern Africa and to France. The company ceased operations in 2008. Discover Cameroon: 'All of Africa in a single Country' or 'Africa in miniature'. accommodation, hotels, attractions, festivals, events, tourist boards, tours and much more. All of Africa in one country. Discover the cultural heritage of Cameroon. by the Cameroon Consulate, Sydney, Australia. 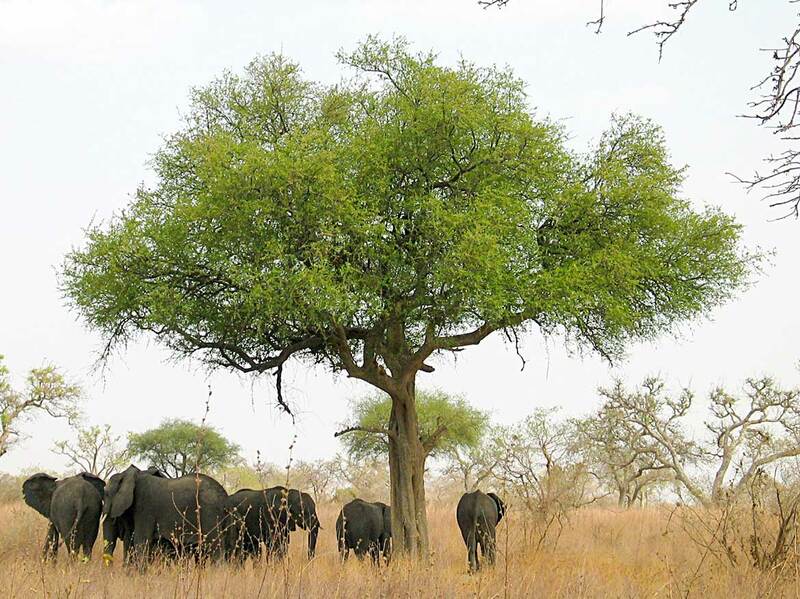 One of the largest and best-protected rainforests in Africa is a UNESCO World Heritage Site. The reserve is especially noted for its biodiversity and a wide variety of primates. Three contiguous national parks of about 750,000 ha in the north-western Congo Basin, where Cameroon, Central African Republic and Congo meet. Cameroon comunity site (in French and English). French language portal site with comprehensive information about the nation. Images of Tchad and Cameroun by Michel Hasson. Founded in 1964 primarily for children of American diplomats but it also serves students from all nationalities and religious groups. National Polytechnic School founded in 1971, Yaounde. The University of Douala is located in Cameroon's largest city. Site about the center, works on sustainable development, mainly with the rural population of the forest zone. Limbe Wildlife Centre (LWC) is a wildlife rescue and rehabilitation project in the South West Region of Cameroon. Ministry of Forests and Wildlife, Cameroon (in French). Ministry of Environment and Nature Protection (in French). Summary by the Cameroon Embassy in the Netherlands. Wikipedia article about Cameroon's History until today. Keyword searchable database of photographs from the German colonial history, the archive covers Namibia, Tanzania, Cameroon, Togo, and other former German colonies.